It goes to show you can never trust what you see on telly - not even the website of a television station! There are a few cuisines which I have never tried to reproduce. I'm not sure exactly why. Perhaps because of my lack of familiarity with the true taste of that country's cuisine. Or maybe I am intimidated by the exotic ingredients or simply that they were unavailable to me. Whatever it is, I have never cooked Korean food. To be honest, I am not terribly fond of Korean food. Or so I thought until a Korean friend cooked me a homecooked meal and I was absolutely enthralled. All that time I thought Korean food was just kimchi and barbeques! 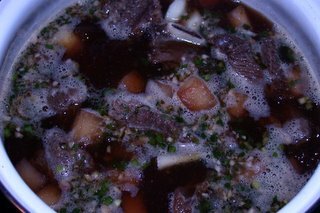 I do like Korean ginseng chicken soup and some of their beef dishes now although some of them can be too heavy for my tastebuds. The recent Korean drama serial, Jewel of the Palace, took Asia by storm. I had no clue what all these dreamy-eyed women were raving about until I caught the show one night. They had food in it! That was it. I was watching it! I did not care for the sappy love story, simpering acting or the melodramatic plot but the scenes of the kitchen maids cooking in the royal kitchen were positively engrossing. I was hooked on all the food and also the medicinal practices depicted in this movie. Since then I have experienced sporadic cravings for Korean food. Something that has never happened before till I watch this show. So recently, when I came across the Korean television channel website, KBS, and discovered that they had a section on traditional Korean food, I was thrilled. 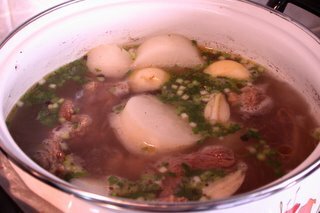 I decided to try out Galbi Tang which is a beef short rib soup with daikon radishes. Admittedly, daikon radishes are not my favourite vegetables since the only way I eat them is as a garnish in Japanese food, but I just wanted to try something different. To wok outside the envelop, as it were. The ingredients looked fairly simple and, at a quick glance, so was the cooking method. I now wish I had studied the recipe a lot harder. 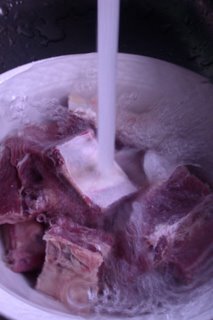 I set forth to Tekka Market to buy the beef short ribs and the obliging butcher cut them to 2 inch cubes for me as asked for in the recipe. After purchasing the daikon radish and the spring onions, I was set as I had everything else in my pantry. This was turning out to be quite an economical meal as the beef short ribs only cost me $5 and the vegetables were less than a dollar! At home, I started organising my mise en place ... and then it struck me. The recipe is awfully ambiguous and from the looks of it, the beef will be boiled to death. Which means that the beef will be tough and tasteless, no? Against all my misgivings, I decided to try to follow the recipe exactly so I can really experience the true taste of Korean cuisine. I wish I had followed my usual course of adulterating recipes instead. Sigh. - are there any other kind? That's it?? I was incredibly disappointed. I think this culinary treatment of beef short ribs is nothing short of criminal. 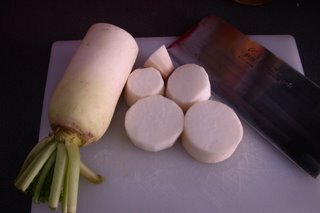 There are no clear indications of time measurements, daikon were also abused and there is really no logic that I can think of for the cooking processes listed. The dipping sauce tried valiantly to salvage the tough and tasteless meat but it was just inadequate. Which is what this whole recipe is. Inadequate. 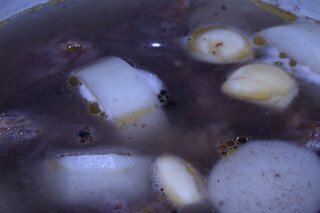 If I had not added the beef stock cube in the broth, it would have tasted like watered down Bovril. 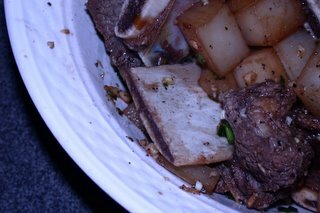 The daikon were overcooked and mushy and I just knew I had to salvage this meal somehow. 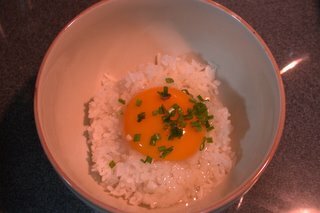 I broke a duck egg on top of some steamed rice and sprinkled some spring onions on top. I then ladled the soup over the egg to coddle it. 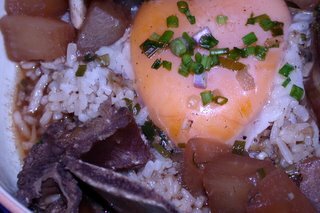 I plated the daikon and ribs around the egg so that it looked like the sun that had fallen to the earth. This did give the dish some added dimension and taste but I must say it still was not my favourite dish. The meat was so tough that I knew I would have to cook it a lot longer in order to pass muster, i.e. my lips again. 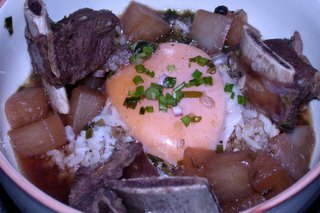 I ended up drinking most of the soup and eating the daikon with the egg and rice. I am going to "reconstitute" this dish tomorrow as I have so much left over. However, as is, this dish gets a 5/10 for taste and a 8/10 for health since we removed the fat. Well, that will teach me to trust what I see on the telly ... website. Ha what a storming critique. Yeah ... I was that pissed off! I totally agree with you. 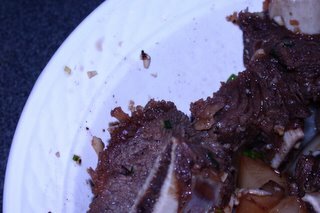 If the cut was an oxtail it may have warranted such culinary misconduct but what did the short ribs ever do to the Koreans??? the dish is acually very good, they had you cook it too long. If you want some good korean dishes just google korean recipes, there is one called korean cookbook.